In 2017, the new terminology of Developmental Language Disorder (DLD) was launched with our campaign ‘DLD 1-2-3’. We want everyone to know about DLD to use consistent terminology. This will enable greater public awareness, research and advocacy for those who are affected. Explore the page to learn how you can help raise awareness for people with Developmental Language Disorder. 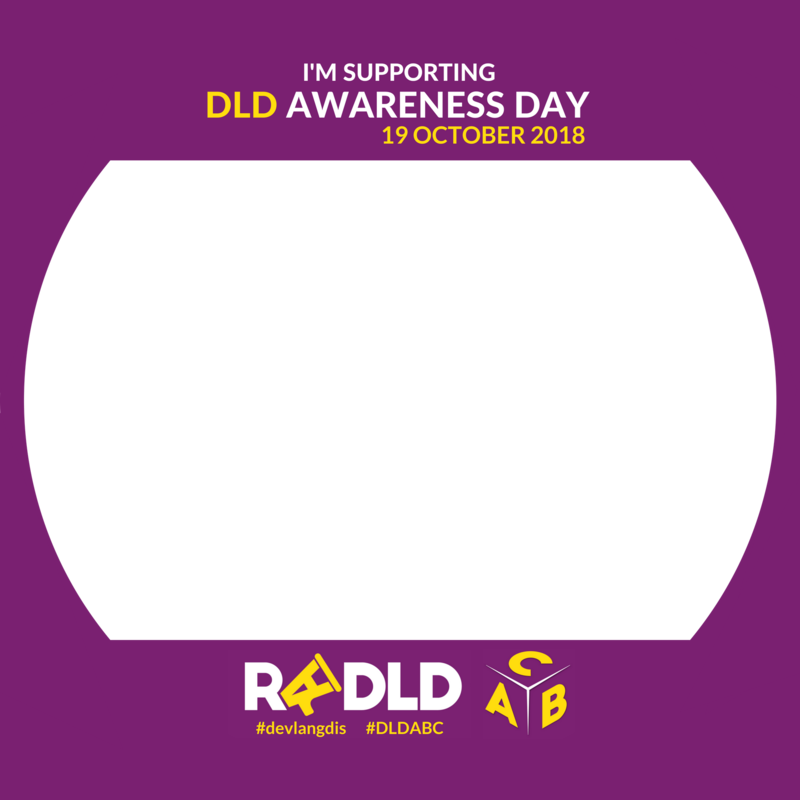 Use our logo and “I’m supporting DLD Awareness Day” graphic for your own personal posters/t-shirts. Look out for our Facebook frame and add it to your profile picture. Have a look around the new www.radld.org website for information and resources to share with colleagues, families and your local community. Have a go at our quiz and share your results on Facebook or Twitter. 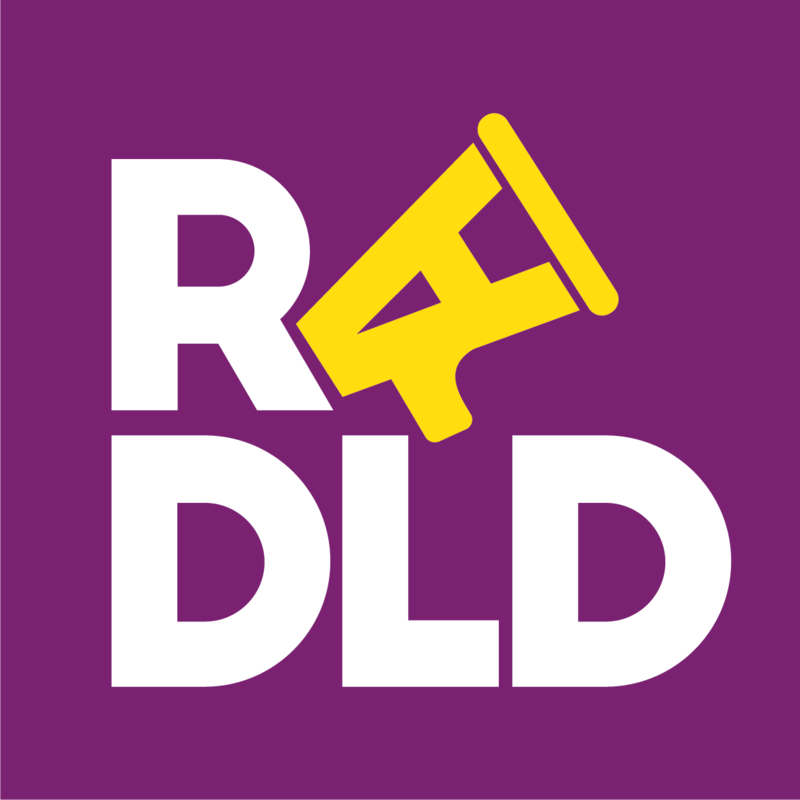 Print your own RADLD stickers, wear these on the day and hand out to others. NB: You need Avery code L7160 address labels or compatible: 7×3 stickers on each sheet, size 3.81cm x 6.35cm. Don’t forget to order your labels sheets before the day so you’re not caught out! We want to spread the word and tell as many people as possible about Developmental Language Disorder (DLD). That’s why we’ve created DLD Awareness Day. DLD is often a hidden condition and that’s why we need your support. We want to make this BIG. We want to let the world know about it so people with DLD can get the right information, help and support they need. Below, we tell you about some of the ways to get involved on social media to support the campaign! What social media platforms can I use? Using Twitter hashtags and @ – IMPORTANT INFORMATION! Use #devlangdis all year around to discuss DLD. DLD 1-2-3 film: This is the award winning film from our DLD Awareness Day in 2017. Use our template press release & fact sheet to submit a story to your local newspaper or a magazine. Enter the name of your organisation and add your own quotes, photos of your event or views of students/ parents/ professionals. Alternatively use the case studies we have supplied from Sophie, Harry, Hannah and Frankie. IMPORTANT: There is an embargo on the press release for 14th October 2019. This means articles should only be published on that date or after. Please help us stick to this to ensure we create momentum at the right time with maximum buzz around the day. DLD Awareness Day Activities: Some simple ideas but do be creative! An informal talk, tea break or meeting about DLD for staff or show a RADLD Youtube video. Use the fact sheet and quiz! Share the fact sheet with schools, doctor’s surgeries, your taxi driver etc. Put stickers on everyone and tell them why they need to know and support! Have a stand in your foyer to share resources, and if possible show a RADLD Youtube video. Share your events on Twitter and Facebook and use them to get a story in the local paper to help raise awareness of DLD. Don’t forget to use #devlangdis and #DLDABC! Make your own t-shirts/ posters using our logo and graphics. Share what you’ve learned about DLD and help create awareness on social media.